FILE - Carter Page, a former foreign policy adviser of Donald Trump, speaks at a news conference at RIA Novosti news agency in Moscow, Dec. 12, 2016. The FBI reportedly obtained a Foreign Intelligence Surveillance Court warrant for Page as part of an investigation into alleged links between Russia and the Trump campaign. There is heightened interest in intelligence surveillance involving American citizens after a report that the FBI obtained a secret court order last year, months before the U.S. election, to monitor the communications of Trump campaign adviser Carter Page. The Washington Post reported Wednesday that the Federal Bureau of Investigation received a Foreign Intelligence Surveillance Court order for Page as part of an investigation into alleged links between Russia and the campaign of Republican candidate Donald Trump. Since Trump's inauguration as president three months ago, he has alleged that U.S. intelligence agents improperly monitored him and his campaign staff in the weeks before he took office. Intelligence and law enforcement agencies have rejected Trump's allegation that his predecessor ordered the tapping of his telephones at Trump Tower in New York. However, they say it is possible communications by Trump and his campaign aides may have been swept up in the "incidental" collection of information during surveillance of a foreign official. There are two sets of laws that govern most surveillance that U.S. intelligence agencies conduct: the 1968 Omnibus Crime Control and Safe Streets Act and the 1978 Foreign Intelligence Surveillance Act. Title III of the 1968 law authorizes law enforcement agencies to surveil electronic communications during criminal investigations. To obtain a Title III warrant, law enforcement agencies must present a federal court with "probable cause" of a crime. While judges approve 99 percent of surveillance applications, they attach heavy strings to their orders: a detailed description of the suspected criminal activity, time and place of the planned surveillance, "minimization" procedures to ensure private conversations are not recorded, periodic reports to the court, and evidence that all other investigative options have been exhausted. "It's a last resort, not the first thing you can do," said former federal prosecutor Alan Vinegrad. In 2015, the latest year for which data are available, courts issued 4,148 warrants, the Electronic Privacy Information Center said. 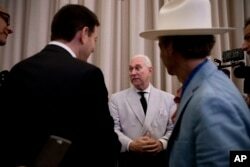 FILE - In this photo taken July 16, 2016, Roger Stone, center, who then was an adviser to Donald Trump, speaks to reporters in New York. Stone says he believes his contacts with a Russian-linked hacker who took credit for breaching the Democratic National Committee were obtained through a FISA warrant. Eavesdropping of foreign nationals and agents inside the United States falls under the Foreign Intelligence Surveillance Act. FISA, which grew out of a landmark 1972 Supreme Court case about warrantless wiretapping and post-Watergate calls for judicial oversight, set up a secret 11-member court to approve foreign surveillance applications. To obtain an order, the National Security Agency and FBI present the court with probable cause that the target is "a foreign power" or "an agent of a foreign power" inside the United States, and that the planned surveillance is for the purpose of gathering "foreign intelligence information." But unlike a wiretap request for a criminal investigation, there is no requirement to show the surveillance target is engaged in wrongdoing. The FISA court approves virtually every application, but not before one of the Justice Department's three most senior officials — the attorney general, the deputy attorney general and the assistant attorney general for national security — signs off. “It’s a very high-level approval process,” said Amy Jeffress, a former top Justice Department official now a partner at the law firm of Arnold & Porter Kaye Scholer in Washington. Until the attacks of September 11, 2001, FISA surveillance mostly targeted foreign spies and diplomats. But with "the arrival of international terrorism on our shores, there has been more focus on that side of things," said William Banks, director of the Institute for National Security and Counterterrorism at Syracuse University. In 2015, the FISA court approved 1,456 surveillance applications, up from 934 in 2001, the Electronic Privacy Information Center said. The 9/11 attacks led then-President George W. Bush to authorize widespread electronic surveillance without congressional authority, leading to concerns about personal privacy and executive overreach. In response, Congress in 2008 passed the FISA Amendments Act, authorizing much of the controversial intelligence gathering. A powerful provision of the law, Section 702, enabled intelligence agencies to conduct "programmatic surveillance" of large swaths of foreign targets and of all incoming and outgoing international electronic communications. The government is not required to ask for court approval of individual surveillance targets. 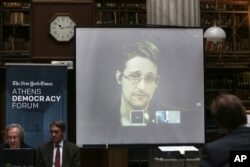 FILE - National Security Agency leaker Edward Snowden speaks via video link during the Athens Democracy Forum, organized by The New York Times, at the National Library in Athens, Sept. 16, 2016. The NSA's two controversial surveillance programs — PRISM and Upstream, which NSA whistle-blower Edward Snowden disclosed in 2013 — are carried out under this provision. According to the Privacy and Civil Liberties Oversight Board, a bipartisan, independent agency within the executive branch of the U.S. government, more than 25 percent of the NSA's intelligence on international terrorism is collected under Section 702. Current and former law enforcement officials credit surveillance with preventing terrorist attacks. But civil liberties advocates worry that conversations of innocent citizens can be incidentally swept up during otherwise well-intentioned surveillance. To allay those concerns, Congress in 2007 created the Privacy and Civil Liberties Oversight Board. In 2014, the board issued 22 recommendations to U.S. intelligence agencies, ranging from ending the NSA's bulk telephone records collection program to publicly releasing the minimization procedures of the CIA, FBI and NSA.